Though there were several iterations and updates to Nintendo’s insanely popular handheld gaming system, the Game Boy was officially retired just over a decade ago. And while Nintendo has no plans to revive the portable console, a company called Retro-Bit is stepping up to bring the Game Boy back from the dead. The Super Retro Boy is essentially a clone of the original Game Boy, carrying forward its highly-recognizable compact form factor. But that’s where the similarities between the two end. 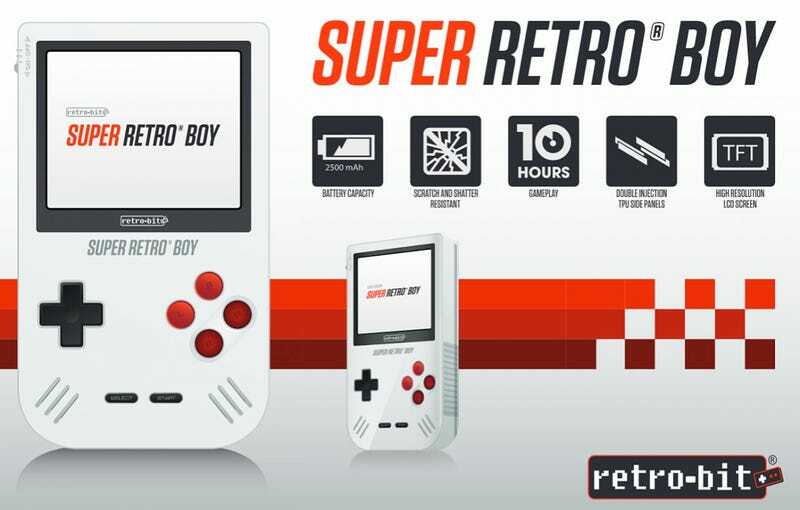 In addition to playing all of your original Game Boy, Game Boy Color, and Game Boy Advance cartridges, the Super Retro Boy will come equipped with a 2,500 mAh rechargeable battery keeping it powered for up to ten hours, a scratch and shatter-resistant TFT HD display, and an easy-to-swallow $80 price tag when it hits North America in August later this year. In order to accommodate Game Boy Advance titles that rely on shoulder buttons, the Super Retro Boy features an extra pair of buttons on the face, just below the standard A and B set. That might make playing certain titles a little more challenging, but it’s a small price to pay for having the Game Boy back again.